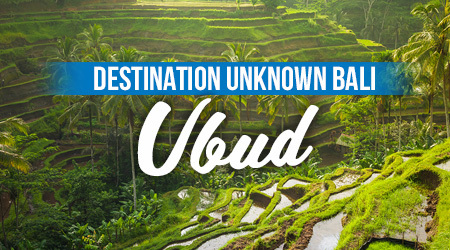 Ubud is Bali’s cultural heart, located in the centre of Bali amongst the cooler mountains and rice fields. Ubud is about 1hrs drive north of the aiport. Ubud and surrounding villages specialise in crafts and wood carving and some of the best artists can be found here as well. Peak travel: July to mid-Sep, mid-Dec to early Jan. Climate: hot & humid year-round, with rainy season Oct-Apr & cooler “dry” season May-Sep.
Travelers from your area typically stay up to 5 days. Driving in Bali is a cheap, fun and relatively safe experience. Despite the apparent madness, motorists are generally tolerant and will give way. Keep your eyes peeled for the green road signs sparsely located along the road. Bear in mind that Ubud is in the Gianyar regency, so do not panic even when road signs indicate Gianyar only, as labels tend to be inconsistent. Currently, there’s no public bus service to Ubud. There are regular public bemos from Denpasar’s Batubulan terminal to Ubud which cost Rp 8,000 (but ongoing foreigners rate is Rp 50,000), and take about an hour. Most bemos run in the early morning, and you will not find any after 16:00. In the opposite direction, bemos depart every morning from the central market (northern entrance) in Ubud. Foreigners are likely to be asked much more (bargain!) or even to charter the whole vehicle – there’s really no need, as they will pick up passengers on the way. With so many shops and stalls it’s hard to name them all.